The release of their eagerly awaited psych-rock opus Cosmic Egg is still a few months off (October 13th, to be exact), but rabid Wolfmother fans won’t have to wait too long to see the award-winning Sydney quartet preview new songs including “Back Round”, as the band has announced that they will support The Killers on the road for a string of dates in North America beginning August 31st at the Merriweather Post Pavilion in Columbia, MD. 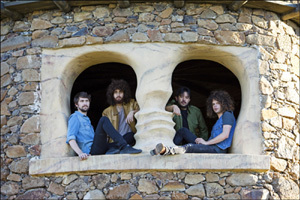 Additionally, Wolfmother has signed on to KROQ’s Epicenter ’09 festival at the Fairplex at Pomona in California on August 22nd. The band will also join AC/DC in February 2010 on its “Black Ice Tour” in Australia.